If asked what makes the perfect quilt pattern, what would you say? Some quilters like chevrons; others prefer rail fences; still others like star quilts and dresden designs. Laurel Albright has found a way to marry all these preferences in one book, Easy-Cut Quilts with a Modern Twist by focusing not simply on design, but overall style. This book asks not, "what design does this quilt use?" but, "how does this quilt's design affect its overall aesthetic?" Each of the seven deceptively simple quilts in this book are distinct, beautiful, and, most importantly, constructed from a wide variety of materials, from pre-cuts to scrap fabric. The absolute best part of Easy-Cut Quilts with a Modern Twist is the variation on each pattern. Every quilt features a "Size Twist," which offers a number of different options for the design so that you can make everything from pillows to placemats to bed quilts and even bed runners. What's more, Laurel also suggests a "Fabric Twist" on each pattern, which shows suggestions for alternate color schemes and palettes. There are seven featured quilts in Easy-Cut Quilts with a Modern Twist, but that number is misleading, as each tutorial features tons of variations and twists to make a new, interesting project. 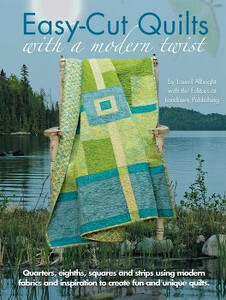 This book offers patterns for quilters of all skill levels. If you are an expert looking for new ways to play with fabric or design alterations, Albright's little Twists will speak to your creative instinct. If your'e a beginner trying to master the basics, you'll have tons of tips and tricks to get you up to speed (not to mention a window into the wonderful world of quilt variation and color). If you could only purchase one new quilt book this year, Easy-Cut Quilts with a Modern Twist should absolutely be your choice. Enter to Win The Quilter's Paper Piecing Workbook! Chance to win the Sugar Berry Fabric Collection!